ActivCare Team accepts award. 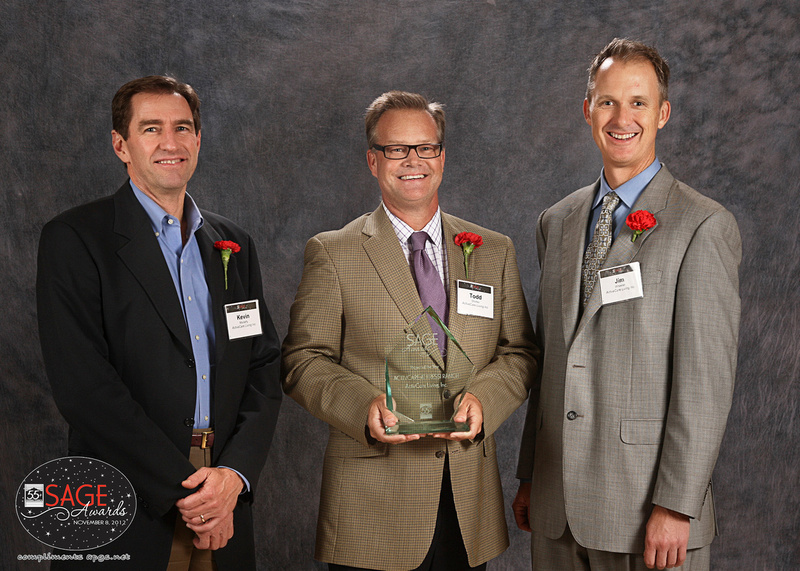 (Left to right) D. Kevin Moriarty, ActivCare vice president - development, Todd A. Shetter, ActivCare chief operations officer, James Wheeler, architect. Memory Care Community ActivCare at Bressi Ranch was recognized last week as Project of the Year by the 55+ Housing Council of the SoCal Building Industry Association. Touted as a model of inspiration for other 55+ housing developments, ActivCare at Bressi Ranch received the honor among other memory care communities in Southern California for its innovative design that meets the needs of its residents. Since 1995, the SAGE Awards have honored individuals, projects and programs that have made an outstanding contribution to enhancing the quality of life for Southern California [Santa Barbara to San Diego] residents aged 55+. ActivCare at Bressi Ranch, which opened in November of 2011, was specifically designed and built to serve the needs of those with memory loss. An open floor plan provides freedom of movement for residents while allowing memory-impaired residents prompts such as colorful murals and a Living Wall to find their way. All paths lead back to the Great Rooms where residents gather for daily meals, exercise classes, musical performances and hand-on activities, reducing confusion and agitation. The community offers a continuum of care for all stages of memory loss. Four residential neighborhoods, each serving a different level of care, congregate into Great Rooms. The Bressi Club is operated as a self-contained neighborhood and is home to residents in early stages of memory loss. Another neighborhood is designed and furnished to care for residents in end stage or on Hospice. ActivCare at Bressi Ranch, located in Carlsbad, California, has 80 accommodations. The residential memory care community has a licensed nurse on staff 24 hours a day and round-the-clock caregivers. For more information, contact ActivCare at Bressi Ranch at (760) 603-9999.